It's been three years since the devasting accident... three years since Mia walked out of Adam's life foreever. Now living on opposite coasts, Mia is Julliard's rising star and Adam is LA tabloid fodder, thanks to his new rock star status and celebrity girlfriend. When Adam gets stuck in New York by himself, chance brings the couple together again, for one last night. As they explore the city that has become Mia's home, Adam and Mia must revisit the past and open their hearts to the future - and each other. A few weeks ago I read If I Stay (you can read my review here) and, at the time I started reading the book, I had no idea there was a sequel to the first book until I had finished and as soon as I had wi-fi I downloaded the book to my kindle. I wanted to have the events of If I Stay as fresh in my mind as I could when I read this book so I waited a few weeks and then dived into Where She Went. 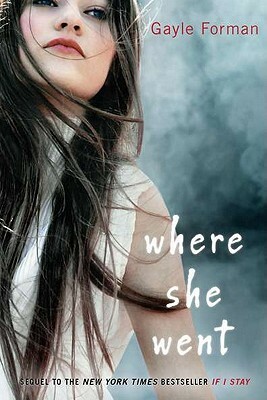 Where She Went is set three years after the end of If I Stay and is narrated from Adam's point of view. Both Adam and Mia have new and very successful lives, Adam's band is well known and popular and Mia is a well-regarded cellist. They haven't seen each other for three years and by pure coincidence, their paths cross and they spend one night together and I loved it! As they walk around New York together you can see and feel how neither of them has fully healed. They still have wounds that I think only having the other around can fix for them. You really feel for Adam in this book, I just wanted to read in and hug him, he is so unhappy with the way things are and has lost his love for his music which I hated. Music meant so much to him and seeing he had fallen out with it broke my heart! I wanted him to find his love for music and for life again. I also fell back in love with Mia too. At the beginning, before I understood where she was coming from, I hated her for what she did to Adam and the damage it caused him. As the book progresses and I read more of her I saw that she really had no other option at the time but it also helped to break her more. I truly believe these two needed to see each other more than they realised. As I got further into the book I had no idea how it was going to end. I really wanted Adam and Mia to get back together, but I didn't see a way they could make it work. Adam had a tour to take part in and so did Mia but I was rooting for them with all my heart. I wanted them to be together again more than I ever have wanted it for two characters in a book. There's a point in this book I loved and that was toward the end when Adam was at Mia's house. They both fall asleep on the couch and I loved that moment, getting to see them have this normalcy again surrounded by a past that they both lost in the form of pictures of Mia's family. And then there's what follows when you find out how much Adam has always meant to Mia and how she has followed and kept one of his most treasured possessions safe. I won't ruin the end and tell you if they find their way back to each other but I will say that this book is a beautifully written and loving tale of two young people who are trying to find their way in life. I did! I felt so sorry for him and just wanted to hug him.